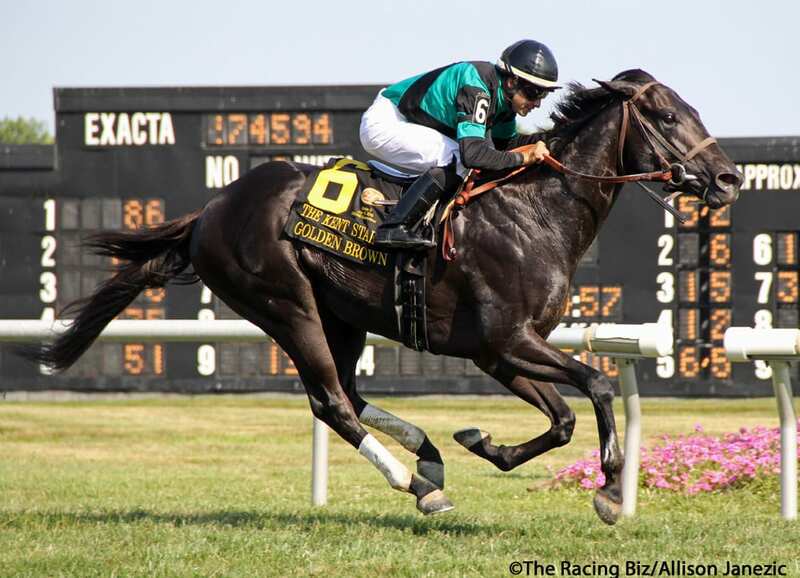 The betfair.com Haskell Invitational added a little more Jersey flavor to Sunday’s 51st edition of Monmouth Park’s signature race, with Grade 3 winner Golden Brown being the latest addition to field, which will number seven 3-year-olds. Trained by Pat McBurney, Golden Brown comes in off an upset victory in the Grade 3 Kent Stakes at nine furlongs on the grass at Delaware Park on July 14. The Jersey-bred son of Offlee Wild-Suzee Sunrise is based at Monmouth Park and has raced four times at the track – three in dirt sprints and once long on the grass. He was a fast-closing second in the Dan Horn Stakes at a mile and a sixteenth on the turf at Monmouth Park on June 17. Kentucky Derby runner-up Good Magic, Preakness runner-up Bravazo, Ohio Derby winner Core Beliefs, Lone Sailor, Navy Commander and Roaming Union comprise the rest of the field for the Grade 1, mile and an eighth Haskell Invitational, which headlines a stakes-filled 14-race card on Sunday. “He has performed so well on the grass that the only way I’d consider trying him on the dirt again right now is in this race. Monmouth Park is home and it’s the Haskell,” said McBurney. “If you’re going to try long on the dirt for the first time this would be the race. That being said, he has actually performed well on the dirt and though they’ve been in sprint races, his sheet numbers are equally as good as what he has run on the turf. Golden Brown shows three wins and three seconds from seven career starts, with lifetime earnings of $209,500. This will be McBurney’s third Haskell starter. Just Call Kenny was sixth in 2014 and Cable Boy was fifth in 2007. So he fully understands the magnitude of the test for his colt.